A Context-based Parametric Relationship Model (CPRM) to Measure the Security and QoS tradeoff in Configurable Environments | Network, Information and Computer Security Lab. Heterogeneity of future networks requires the use of extensible models to understand the Security and QoS tradeoff. 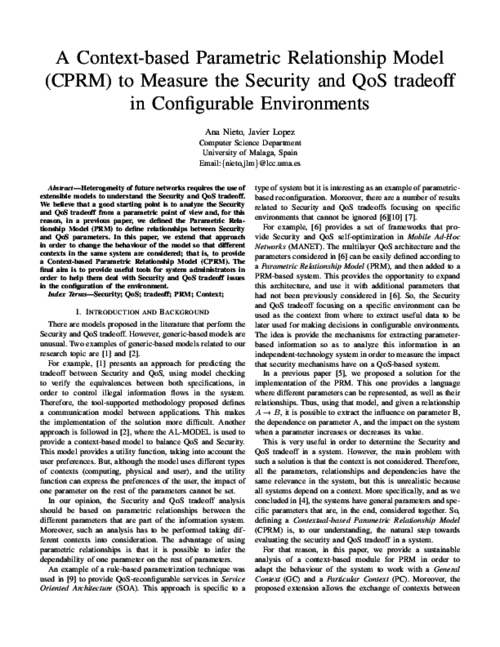 We believe that a good starting point is to analyze the Security and QoS tradeoff from a parametric point of view and, for this reason, in a previous paper, we defined the Parametric Rela- tionship Model (PRM) to define relationships between Security and QoS parameters. In this paper, we extend that approach in order to change the behaviour of the model so that different contexts in the same system are considered; that is, to provide a Context-based Parametric Relationship Model (CPRM). The final aim is to provide useful tools for system administrators in order to help them deal with Security and QoS tradeoff issues in the configuration of the environment.